Esplodine Dollarbender | That Was an Accident! Miss Bilgewater! Town-In-A-Box Festival Princess! Esplodine envisons herself as something of a beauty pagaent queen, and openly admits to taking up magic mostly for the outfits. While she’s quite vain, she’s also quite good at keeping it to herself under most circumstances, and is therefore still tolerable. Well … as long as she doesn’t start ordering people around, that is. That tendency is a little harder for her to suppress. Esplodine is lazy. She’s also something of a coward, and will carefully study an area before setting foot in it. 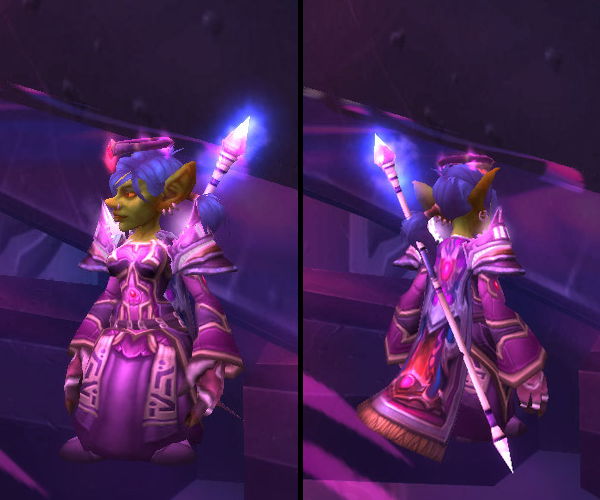 In an ideal world, there would be hundreds of dashing goblin and blood elf men between her and any potential harm, ready to protect her at a moment’s notice. (What does that Azshara chick have that Esplodine doesn’t? Sigh.) Since that’s definitely not the case, she just tries to shoot the sheeyit out of anything and everything before it can hit back. She is occasionally successful in this endeavor. Sometimes, she just loses her patience and charges in anyway. You can imagine how that ends.